1. Infographics! They’re all the rage. If you can’t do the work in Photoshop, (we love Photoshop Elements – a simpler version that you can download inexpensively), then look into Fiverr.com or elance.com. A top shelf infographic can get pinned & repinned over and over and over. That ongoing traffic stream back to your blog or ecommerce site has real value – it’s worth spending real time, (or money if needed), to make happen. 2. Video! 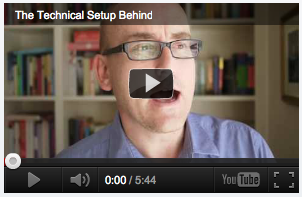 I’m too shy to pull this off at the moment, but you gotta check out Darren Rowse at problogger.net. He does a great job of using video as a blogging tool. The great part about video of course is that it’s always uniquely original content. Do it well, focused on a solid niche topic, and you’ll be off to a great start. 3. Create Magnetic Pinterest Images, read our post about it. This could come naturally if you have a product centric business. Just work hard to approach your product photography from an artistic point of view. Help your prospective customers express themselves using your images. 4. Use the special forms of Pinterest content options: Long-Form Pinutorial, Curiosity Driven Pinutorial, Quotes, How-To & educational content. Most importantly, add something meaningful to the internet that your prospects can enjoy & pin. How do you post a video on Pinterest? Once you have it installed, then you simply go to a Youtube video, and click the ‘Pin It’ button – it will load an image of the video that has the ‘play’ looking triangle. You choose that one. It might also display some images that you could pin – but that would just be like pinning a regular picture. I have not tried to pin a video from Viddler or Vimeo, but I’d imagine they work the same. Let us know if we can be of any further help!